Ursula Brown immigrated to the U.S. in 1966 from Germany via Mexico, Costa Rica, and Central America. She was raised near her grandparents farm post-World War II. She owned a Property Management/Real Estate office and her home in Highland Park includes ducks, chickens, birds, dogs, and cats-all abandoned by their owners. Animal welfare has always been close to her heart, from her childhood spent with farm animals to seeing how some people neglect or abandon their animals when they move. In an effort to advance animal welfare and contribute to a better community, Ursula originally spearheaded the effort to establish an off-leash dog park in Eagle Rock. Unable to locate suitable land in Eagle Rock, but with solid support from city agencies, the cause was picked up by the community of Hermon who successfully carried it to completion. Ursula’s professional and community affiliations are: Member of Northeast L.A./Glendale Board of Realtors; Fraternal Order of the Eagles Auxiliary; Eagle Rock Lions Club; Eagle Rock Center for the Arts; B.L.E.N.D. ; Damenchor Frohsinn; Officer, Eagle Rock Chamber of Commerce; Board Member, Collaborative Eagle Rock Beautiful; Board Member, Northeast Awareness Team (NEAT). Sherry Uribe is a founding member of Friends of Hermon Dog Park. She has been a long time resident of the El Sereno area living with her husband, children, dogs and cats. She has served on various committees at her children’s schools and currently works for the County of Los Angeles Public Library. Her children have been active in the sports programs offered at El Sereno Park. She enjoys reading, gardening, and meeting others that share her love of pets and their well being. Family legend has it that Linda Torn pushed her first cat around in a baby stroller and squealed with delight when her dog gave birth to “gophers”. She’s been surrounded by dogs and cats ever since. An ardent advocate of TNR animal rescue, she’s bottle-fed orphaned kittens and found homes for a variety of strays. Her current brood is small at one dog and one cat. A native of Southern California and long time resident of Montecito Heights, she is a retired administrator for a children’s health program. Kathryn “Kat” Spofford was born in Houston, Texas. Her uncle, a veterinarian, presented her with her first terrier. She grew to love all dogs but especially terriers and she’s owned 6 terrier breeds over the years. After moving to Highland Park in 2008, Kat’s first order of business was to find a dog park near her home. Kat says, “I discovered Hermon Dog Park and became a member soon after.” Kat now resides back in her home town, Houston, Texas. 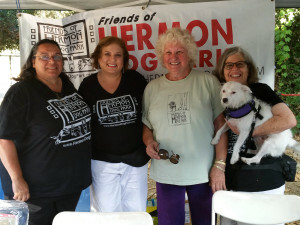 Nancy Nickerson is a past Co-President of Friends of Hermon Dog Park (2009 – 2014). She is a producer and project manager of web sites and digital media, and spends much of her free time involved with community activities, including being a founder and board member of the Mt. Washington Jessica Neighborhood. She is a lifelong animal lover who shares her Mt. Washington home with an exuberant terrier mix (Bark Avenue Foundation rescue and graduate of K9 Connection) and two friendly tabby cats (Lacy St. rescue and park squatter). Wendi Riser was president and co-president of the Friends of Hermon Dog Park from its inception until June of 2012. A life-long resident and advocate for the community of Hermon, Wendi has spearheaded beautification and safety efforts, organized a day-long festival celebrating Hermon’s 100-year anniversary of joining the City of Los Angeles, and was honored in August of 2012 by Jose Huizar as the CD14 2012 Pioneer Woman of the Year. Wendi Riser has lived in Hermon nearly her entire life. She began working with Donnette Thayer, our city councilmember, and the Department of Recreation & Parks in early 2003 to get the Hermon Dog Park approved in concept and then saw it through to its completion in July of 2005. Wendi has spearheaded many other Hermon community projects as well — such as getting over 100 new trees planted in Hermon’s parkways, medians, hillsides and home gardens, getting students to design 2003 centennial street light post banners, the creation of the beautiful Hermon monument sign and managing the city grant that funded it. Wendi writes a fun and quirky e-newsletter “All Things Hermon” with info on things happening in and around the historic little community. The Hermon Advance Team (HAT), the service organization of Hermon, was founded by Wendi and others in 2004. It includes the monthly “Clean Team”– a group of neighbors that clean the parkways and bridges, as well as a bi-annual community bulky item collection. HAT also sponsors quarterly meetings of the Hermon Safety Committee, a community-wide neighborhood watch to proactively address and prevent crime. A graduate of Animal Behavior and Training College, Lezle Stein is AKC-certified as a Canine Good Citizen Evaluator and a professional member of the Association of Pet Dog Trainers as well as a member of the Southern California Dog Trainers Forum. Lezle’s extensive experience also includes American Red Cross certification in Pet First Aid and CPR. She has also participated with her own dog, Lucie Bell, in obedience, agility and shepherding training. Lezle was the volunteer adoption counselor & dog rehabilitator for Downtown Dog Rescue, Los Angeles ‘ rescue group for homeless people & low-income people and their dogs for many years. A firm believer in community involvement Lezle, was also the Director of Animal Welfare for the Arroyo Seco Neighborhood Council. She was selected by Councilman Jose Huizar, to sit on the board of The Los Angeles City Council Spay & Neuter Committee. Lezle has written dog training advise columns for the Highland Park News, Glassell Park News and the Mt. Washington Association. She has also studied with Dr. Nancy Scanlon, who specializes in holistic veterinary medicine through acupuncture and herbs. Lezle continues her education through frequent seminars and training with her own dogs doing fun nose work (scent detection) and agility too! She now resides in North Carolina.